"We have a wonderful show. Our guest star is one of the all time multitalented, beautiful ladies of the world, Miss Bernadette Peters." The old saying, "Good things come to those who wait" more than applies to fans of The Muppet Show. Nearly two years after the first, seasonal box set of the show was released on DVD, we finally see the second batch of episodes appear on the format. Thankfully, it is, indeed, well worth the wait, as Disney presents the entire season in a similar package, minus a few of the extras that were there the first time around, but plus some that are even better than before. See for yourself, as all 24 episodes from Season Two are presented in one nice, Miss Piggy-esque collection. This season is really the true beginning of the show, as we remember it, from the opening music number to Miss Piggy looking like, well, Miss Piggy. In all, the design of the Muppets, themselves, took on a more stream-lined, sharper look, with brighter-colored "fur" among other intricate details. Henson shuffled his writing staff around, narrowing them down and making Jerry Juhl the head writer, lending more focus and care to the most important aspects of the show's content. The most important change, arguably, was the decision to devote more time to the celebrity guest stars, putting them in more segments, and allowing them to exhibit more of the talents that made them famous. Disc 1 kicks the season off with the hilarious Don Knotts, who instantly gives us a sign of the beefed-up role that this season's guest stars would have. After Knotts' hilarious season-opening stint, we got the star of Mel Brooks' original film version of The Producers, Zero Mostel. In what would be his final TV appearance, he showed off just enough of his comedic side for this show, but it's clear he's a bit out of his element. We're back to natural comedians in the next two episodes, with Milton Berle and Rich Little stopping by. Then, it's back to non-comedians to close out the first disc, with appearances by Judy Collins and Nancy Walker. The second DVD begins with Edgar Bergen as the guest star, who must have enjoyed himself, as he later appeared in The Muppet Movie. A much younger Steve Martin is at his usual funny best, but he's upstaged by the next episode's "host," Madeline Kahn, who seems to be enjoying herself more than anyone in this set. The great George Burns, circa the Oh, God! movies, shows he still has it, while The Cannonball Run's Dom DeLuise oozes charm and sheer goofiness. Stints by Bernadette Peters and Rudolf Nureyev bring Disc 2 to a close. Two of the best episodes in the history of the show appear on Disc 3. The first features Elton John in the midst of his prime, performing hits like "Don't Go Breaking My Heart," (with Miss Piggy in tow) among other tunes. The other is the last installment on this disc, and it has none other than the great Peter Sellers. As evidenced by his amazing filmography, Sellers has amazing range, and he interacts with the Muppets in a natural, hilarious way throughout. Sure, it's not Dr. Strangelove, but Sellers proves, once again, that he truly was a genius. The guest stars on the rest of this disc aren't exactly pushovers either, with Lou Rawls, Cleo Laine, Jaye P. Morgan, and even Julie Andrews headlining. The fourth and final disc only had five episodes, leaving room for the set's extras. John Cleese's appearance is easily the highlight. He takes a page out of his past comedy work by posing as a pirate and going on about an Ex-Parrot, which will have much of the adult audience rolling with laughter. Other than Bob Hope's show, the Muppets are the main reason (and reason enough) to enjoy the rest of these, despite the presence of Teresa Brewer, Petula Clark, and Cloris Leachman. This is simply a wonderful collection of television's finest variety show, and here's hoping we don't have to wait two more years for the third season's set. Image Transfer Review: As with the first season's set, every episode is presented in its original full frame format. This is easily the best these shows have ever looked on any format, thanks in large part to a hearty effort to clean up as much of the grain, dirt, and other print flaws as possible. The images are sharper and more detailed than ever, also, and are accompanied by a bright, vivid color palette that makes the Muppets practically burst off of the screen. There are still a few blemishes, but given the age of these shows, that's more than understandable. Audio Transfer Review: The revamped audio is presented in Dolby Digital 2.0, and is nearly as impressive as the video. Various aspects of the remastering are easy to notice, but none sound unnatural, preserving the integrity of the old series. Almost everything stays up front, but some of the music branches out to the rear speakers. The hilarious dialogue is always crystal clear, and is never overcome by the music or other sound elements. The Muppets on the Muppets - Interviews with the title characters. Extras Review: While not overflowing with extras, this set goes for quality over quantity in that department. All three extras are on Disc 4, with the first being The Muppets Valentine Special. This 25-minute special originally aired in January of 1974, which was before the actual series ever began. The guest star is Mia Farrow, and it's very interesting to see many of these characters with different looks, names, and other features than what we've grown accustomed to through the years. The Muppets on the Muppets a collection of interviews running a total of 12 minutes. This is basically further funny banter between most of the main Muppet characters, making these recently-clips well worth a look. We also get the great Weezer video for their song "Keep Fishin,'" that prominently features The Muppets. 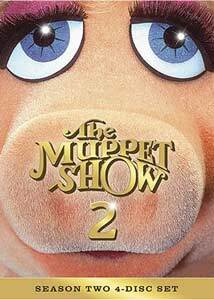 Whether you're infatuated with Animal (myself included), or can't get enough of Fozzie's "Wocka, Wocka"s, any and all Muppets fans simply have to run out and grab The Muppet Show: Season Two. Disney does a fine job presenting each show with the best possible audio and video, and including a nice selection of extras.